Photo credit Trevor Shirk. a mixed bouquet of garden fresh Alstroemeria: 'Rosea', 'Champagne', and 'Inticancha Red'. Though I think of myself as a reasonably pleasant person, I don't attempt to fool myself as to the source of my popularity every summer. No, it's not my vivacious personality or sparkling wit, but the profuse abundance of cut flowers with which I bless my friends and acquaintances come June. Though most gardeners find themselves with numerous flowers to enjoy outside in the garden, flowers that last in a vase without exploding their petals all over the carpet or drooping dramatically hours after being cut are a somewhat rarer breed. Though tricks abound to extend the life of flowers in a vase (vodka, soda, and bleach are all commonly recommended), the most important element in a successful homegrown bouquet is selecting the right plant. 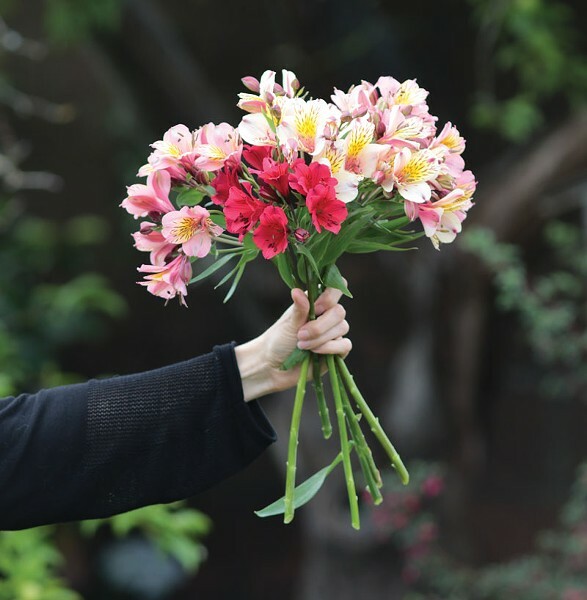 Here are my favorites that mix well, flower profusely and will give you such a bounty of blooms that you will join me in bringing bouquets to your friends, neighbors and dentist. Though I'm frequently mocked by gardening friends for my excessive love of Alstroemeria (I have at least 14 in my average-sized backyard, with more on my wish list), it's hard to top them for sheer quantity of flowers, length of bloom time and the wonderful variety of colors. Large, rounded clusters of lily-like blooms rise above lush clumps of spring green foliage, and each cluster of blooms can last one to two weeks in a vase, which explains why they are such darlings of the floral industry. Though the taller varieties have a tendency to flop, I simply put in a circular grid stake when planting so the stems rise up through the stake and the plant stays largely upright even in the height of bloom. Here in Humboldt, they flower May through July, pause during August and September, and come back for another round in fall. Alstroemeria 'Champagne': This elegant variety is an antique-toned shade of cream, with blush pink accents and a flash of canary yellow on the inside. Because it has so many shades of pink, cream, coral and yellow, it goes with pretty much any other flower you'd care to pair with it, and can be cooled off with purple, lit up with warm reds or yellows, or blended with coral. The lilac color of Liatris is my favorite partner with this plant. Alstroemeria pelegrina 'Rosea': If you've ever seen Alstroemeria in a florist's shop, this classic is likely the one you saw. It's a blushed coral color with a yellow flare on the inside of the top and bottom petals, and the usual reddish-brown markings which give them such a vivid and distinctive look. Like all Peruvian lilies, they are tolerant of damp soil, deer and mild drought (they will simply go summer dormant if they grow too dry, returning to bloom again in fall). Alstroemeria 'Inticancha Red': While most older varieties of Alstroemeria grow about 3 feet tall in politely spreading clumps, the Inticancha and Princess series are dwarf varieties which grow about a foot tall. 'Inticancha Red' is a rich cherry red that brings to mind the color of everybody's dream sports car. It is a blue-toned red, so it goes well with pinks and purples, but also combines nicely with hot colors, if that is more your speed. Though the dwarf varieties are slightly less vigorous and therefore provide fewer flowers, one or two of these vivid stalks will enhance the look of the more prolific, taller-growing varieties. We are all familiar with regular, old Shasta daisies, and though they are common as dirt, they have a classic appeal that can't be beat. Older varieties of white flowering Shasta Daisy like 'Alaska' bloom for a long season and put out such a ridiculous quantity of flowers that you can give away bouquet after bouquet without noticing any difference on your plant. Unfortunately, they also have a tendency to flop. Though circular grid stakes help, these garden monsters can overwhelm their neighbors and take over the garden when in bloom. That's why I've been favoring the newer dwarf varieties of Shasta daisy, which come in colored or ruffled versions that put a fun twist on an old fave. 'Banana Cream' Shasta daisy: The lemon yellow center of Shasta daisies glows brightly in a bouquet, and when accented with pale yellow petals, the effect is incredibly cheering. Though many yellows veer in a somewhat garish direction toward gold, these blooms have enough yellow to light up a vase, yet aren't such a bold color that you'll find them hard to mix with other flowers or your interior decor. Best of all, they reach a humble 2 feet tall and stay upright much better than their taller relatives. 'Belgian Lace' Shasta daisy: Though I've long been a fan of the frizzled, wildly disorganized blooms of 'Crazy Daisy', a moderately-sized variety which flops only minimally, sometimes I prefer a look that's a little more refined. Enter 'Belgian Lace,' a double-flowering, white variety with a neatly arranged corona of petals that have light shredding at the tips. The fringed petal tips give it an elegant softness that pairs beautifully with almost any other bloom, and this dwarf variety reaches only a foot tall, making it ideal for the front of the border. 'East Friesland' meadow sage (Salvia nemorosa 'East Friesland'): A warmer-toned version of the classic 'May Night', this long-blooming meadow sage forms petite clumps reaching 18 inches tall, and blooms nonstop from spring through fall. Though the flowers only last about five days indoors, the tight, purple spikes make such a beautiful contrast with fluffier cut flowers that I consider them an invaluable addition to my cutting garden. Once they fade, they are easy to pull out of the bouquet without disrupting the other flowers. Crocosmia 'Lucifer' and 'Walberton Yellow': Though most of us in Humboldt County are "blessed" with a few of the invasive orange firecracker lilies, which ride in on a gifted plant from a neighbor and then take over the garden, the tall, strongly upright, red variety 'Lucifer' and the softly-textured yellow blooms of 'Walberton Yellow' are well-behaved perennials which you can feel comfortable inviting into your garden. Both will satisfy your desire for hot colors throughout the summer and will last up to a week in a vase. Dahlias, of course: If you're a gardener, you will have noticed all of the lovely impulse-buy-inducing dahlia tubers in the garden shops this spring, but if you missed that boat, dahlias are also available in pots once they begin to bloom in summer, and this can be a much more satisfying way of purchasing because you get an accurate view of what the flowers will look like. After one or two disappointing experiences with something that was gorgeous in the photo but bleached out to an ugly color in the garden, I've stuck with purchasing them in bloom at the farmers market or the garden center. I'm partial to the little, pom-pom flowers or the spiky, cactus-style blooms, but this much is certain: when you plant them, you should immediately put stakes in the ground while you still know where the roots are, so they will be easy to tie up come summer without having to chance piercing those huge, potato-like tubers. Genevieve Schmidt is a landscape designer and owns a fine landscape maintenance company in Arcata. Visit her on the web at www.GenevieveSchmidtDesign.com.